If people are asked what they should avoid eating, among other things they will definitely mention fats. Indeed, the excess of fat in daily meals may lead to sad results for the health let alone the waist measurement. However, we can’t forget that fats play one of the most important roles in the human body and their complete elimination from daily meals leads to the consequences which are perhaps even worse than their excess. Fats and triglycerides are natural organic compounds, compound esters of glycerin and fatty acid esters, included in the group of lipids. Above all they perform structural and energetic functions in the living body: they are the main component of cell membrane and the reserves of energy are saved in the fatty cells of the body. Fat plays the important role in maintaining skin and hair health, protects the internals from contacts with the environment, helps to maintain the normal temperature of the body and helps the cells to function in a proper way. Besides that fat is an energy storage, one gram of fat contains 37 kilojoules (8.8 kcal/gr) which is twice more than in carbohydrates. When necessary the human body transforms fat into energy. This is a very complicated, not completely studied process. Hibernators are a wonderful example of using fat as a life support system. For example the bear can sleep for 7 months and during all this period his life is supported by internal reserves. Vitamins A, D, E and K are fat soluble. In other words they can be consumed only with the help of fats. Fats are also the source of essential fatty acids, which are necessary for the normal functioning of the body. Technically the hibernators’ fat (bear’s, badger’s or marmot’s) can be consumed directly on hunting farms of Siberia and the Far East, which is connected with some difficulties. However, it is not all that one may face. First of all, while rendering and transporting the contact of the fat with air and metallic surface should be minimized to avoid combustion and rancidity. As a whole instability is one of the chemical peculiarity of polyunsaturated fatty acids. Beside that, raw tallow has peculiar taste and smell which makes its consumption problematic. Polyunsaturated fats have very low melting and evaporation points, They don’t thicken at room temperature. If warmed up to 80 degrees, fat can lose most part of its useful qualities. To avoid loosing useful qualities while rendering Fitosila Company worked out and realized the unique method of rendering animal fats which allows getting ready for use product without unnecessary protein admixture and at the same time saving maximum number of valuable qualities. The core point of this technology is the following: milled gum-state mass is rendered in autoclaved reservoir in water medium, strictly hermetically, keeping the temperature, rate of heating and definite pressure inside the reservoir at a precise level. Thus influence of the ferment of lipase is neutralized which in other conditions quickly acetifies the fat at 65 degrees. At the same time constant low pressure and definite temperature don’t allow useful components to evaporate. The rendering process takes 3 hours. While the mass is cooling down, the pressure becomes equal with atmospheric. At the end there remains liquid in the reservoir which is divided into two fractions: clear oil-fat is above, water contaminated by water-soluble protein and small particles of connective tissue (so called fusa) is below. Also during the rendering process free fatty acids are removed which allows to lower oxidation of the final product. Fat is ladled from the reservoir after 25-30 minutes. Before appearing in the chemists shop fat goes through several other procedures: refining, deodorization and bleaching. Due to this process the product becomes practically free of admixture and unpleasant smells. But the unique technology of fat rendering allows saving its useful qualities. If we have a look at the chromatograms of ready-made bear’s, badger’s or marmot’s fat, it becomes obvious that these products are a rich mixture of fatty acids of different groups. Such combination and proportion of fats are optimal and it has been proved for thousands of years of the evolution. That is why the supplements based on the fats of wild animals are more beneficial for health than those in which Omega-3 and Omega-6 are presented in the form of extract. It is necessary to add that the ester is used for the normal extraction of PUFAs and its print inevitably remains in the final product. Omega-3 and Omega-6 acid groups include, in total, 21 substances (11 and 10 in each group accordingly) and there are also Omega-7 and Omega-9 families. The characteristics of these groups are not studied completely yet but already made results are enough to consider the usefulness of Omegas proved. All these fatty acids are polyunsaturated fats. In 2009 the World Health Organization, Food and Agricultural Organization of the United Nations together with the European Food Safety Authority reconsidered the results of previous research and recommended to increase the norms of consumption of other fatty acids of Omega-3 group. This decision, in particular, was based on the proved usefulness of the fish oil which contains in general Arbitrary-replaceable fatty acids (for instance, Eicosapentaenoic and Docosahexaenoic). • It is known that Omega-3 acids are necessary for growth and development of the body and play an important role in preventing and curing ischemic heart disease, high blood pressure, rheumatoid arthritis, other inflammatory and immune diseases including cancer. Lack of Omega-3 acid group in the child’s menu leads to development of intellectual and physical delay. <pHowever, all mentioned above is not the reason to buy the fatter sausage. Unfortunately most fats which usual food contains are not connected with Omega-3, Omega-6 or polyunsaturated fatty acids in any way. Labels on food products are brief indeed: proteins, fats, carbohydrates, calories. “Healthier” food is considered to have the lowest number of calories, fats and carbohydrates. However, the word “fats” means more than 130 different substances, each of them influences metabolism and the whole state of health in its own way. In dietary cheese there are fewer fats indeed but the remaining 60% contains saturated fatty acids and there are no useful polyunsaturated fats at all. At the same time dripping (or famous Ukrainian cured pork fat) contains 39% of saturated fats and 11% of polyunsaturated ones. Flaxseed oil (99% of fats) contains 66% of polyunsaturated fats and only 11% of saturated ones. The most active research connected with the influence of saturated fats on the human body has been conducted from the beginning of the 90s and most of the results show that the increased consumption of this type of fat is closely connected with heart and vascular diseases, higher level of “bad” cholesterol, obesity and even with several forms of cancer. As it was already mentioned, it is harmful for health to exclude fat products from daily meals completely because if it is done so, useful fats and other useful components will disappear too. Of course, it is worth excluding or significantly decrease the consumption of some products. For example, so called processed food contains a big number of both harmful fats and other non-healthy components. However, even a healthy diet cannot provide the human body with necessary components in right proportions completely. Omega-3 and Omega-6 polyunsaturated fatty acids are undoubtedly useful but they also play the role of proportion in which these components get into the body. There is a wide-spread opinion that during the evolution, when the meals were most natural, the correlation of Omega-3 and Omega-6 acids in the diet was approximately 1:1, at the same time the total number of fats in the food was a little more than 20%. 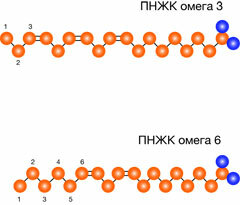 Up-to-date research shows that the optimal proportion of Omega-3 and Omega-6 for a person is 4:1. At the same time the average correlation of these acid groups in a standard diet is 1:15, mainly due to the consumption of vegetable oil which is rich with Omega-6. Such a disproportion seriously increases the risk of arthritis and different inflammation including oncologic ones. Accidentally most consumed unsaturated acids are Omega-6 because they are more wide-spread in vegetable oil which is often used in present day meals. At the same time due to decreasing use of fish and meat of wild animals food contains dramatically low amount of Omega-3. Domestic animals are bred on artificial and combined feed which are rich with corn containing Omega-6 and it influences the food ingredients. The same is true for industrial fish, poultry and the production of eggs. To the great disappointment of big fans of healthy life style it is practically impossible to get absolutely balanced set of elements from usual food. The civilization has developed too far and a person who lives in the familiar environment cannot get food by hunting or gathering. Thus, the consumption of wild hibernators’ fat is practically the only method to enrich the body with missing quantity of elements and to balance the correlation of polyunsaturated fatty acids of different groups. Thanks to specific life cycle of such animals their subcutaneous fat is the valuable source of precious elements. They are polyunsaturated fats, vitamins A, D, E, K, microelements and minerals. Due to this “wealth” the animal can live through the long period of hibernation. It is interesting that Omega-3 fatty acids don’t synthesize in necessary quantity by domestic and most carnivores who lead an active life in the winter. The qualitative composition of hibernators’ fat has been studied by many researchers for more than 50 years. For example, 25 fatty acids were identified in the marmot’s fat, from 9 to 13 acids were indentified in the brown bear’s fat. Omega-6 and Omega-3 fatty acids are biologically active components which guarantee their high curative and nutritive value. Raw tallow used by Fitosila Ltd for the production of biologically active supplements is obtained only by hunting farms by licensed culling of wild animals. Indeed, the fat of the animal bred in natural environment has all the components thanks to which it is so useful.